Not your average wallmount easel, the Best Wallmount Easel is in a class of its own as the clear choice for the serious artist with limited studio space. Most wallmount easels are small and light for quick and easy storage, but Best understands that many professional artists must achieve balance between space concerns and workability. The Wallmount Easel achieves both goals, as a heavy–duty model that accommodates a large canvas with zero use of floor space. The hand-sanded, stained oak construction and durable crank system securely hold even large gallery-size canvases, lifting them up and down with quiet ease. 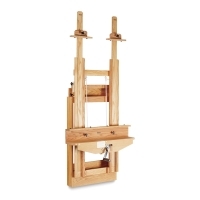 The easel can be used in a vertical position or tilted forward up to 80° for glare reduction or to provide a comfortable angle for the pastel artist. 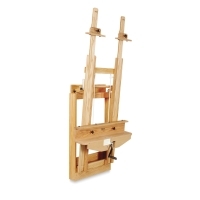 This sturdy easel can accommodate canvases up to 88" (224 cm) high, measures 32"W × 14"D (81 cm × 36 cm), and has a maximum height of 102" (259 cm) when fully extended. The easel measures 55" (140 cm) high when folded. 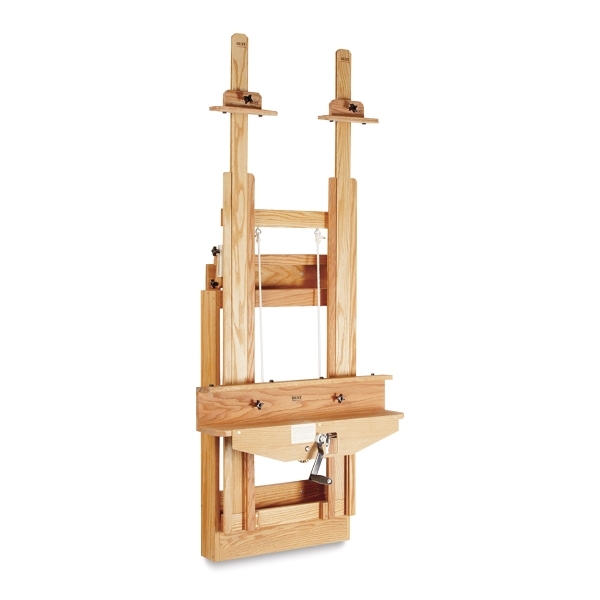 The Best Wallmount Easel weighs 53 lbs (24 kg) and requires assembly.